Now available in a spray bottle for smaller jobs. 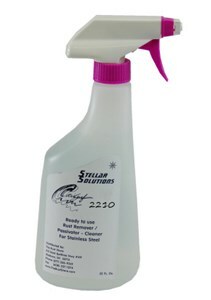 Citrisurf 2210 is also available in a 1-gallon container. Prior to use, mix thoroughly by shaking or stirring. CitriSurf 2210 should be applied liberally to the surface to be treated with a sprayer, brush or roller. Coverage is approximately 50 square feet. Wait approximately 10 to 30 minutes, depending on the application, and then rinse the product from the surface completely. Repeat process if needed to obtain desired results.